This is very exciting. 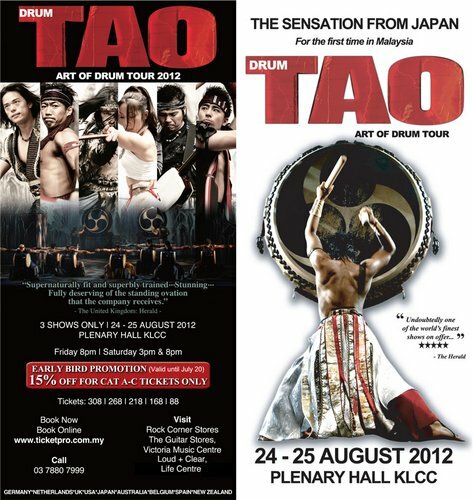 The famous Drum Tao - "Art of Drum" Tour will be perfoming a Plenary Hall KLCC on 24th and 25th August 2012. The much awaited event will surely be eye opening to many in Malaysian. The company have been established since 1993 and had performed for more than 5millions, in 400 cities 17 countries which includes Switzerland, Denmark, UK, Australia, Spain and Germany. Their unique blend of ancient martial art and modern percussion artistry performance is of world class. In the two hours performance, you'll be amazed by the intricate choreography, the musician physical fitness and the dynamism synchronicity which makes the company to be Japan’s most celebrated and elite company of martial drummers. Just watch the video above. Don't you feel their breathtaking performance? 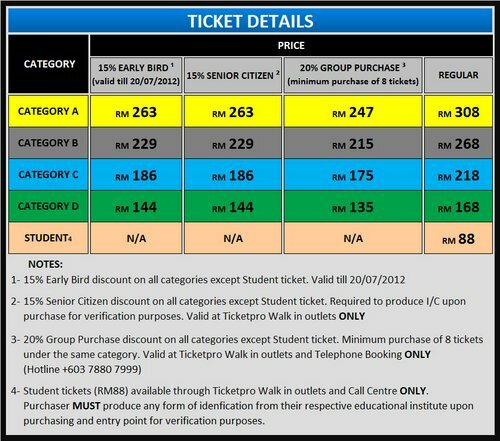 The ticketing pricing are as above. There is a 15% early bird promotion if purchased before 20 July 2012. So what are you waiting for? Book now to avoid disappointments and to enjoy the early bird promotion. fuyoh mamarazzi so good with the karangan, hahaha!! i really think this is a very awesome performance.. i want to watch this so much!! last time in high school i already love this kind of martial arts drum performance ga la.. I love kitaro and will certainly love this one! Hohoho... ur going to this boom boom event or not?